When I first started sending out email campaigns I often wondered why some emails reached their targets and others just dissolved into the cyber space box called SPAM. I’m not ashamed to admit it because I’m sure I’m not the only one that this has happened to. 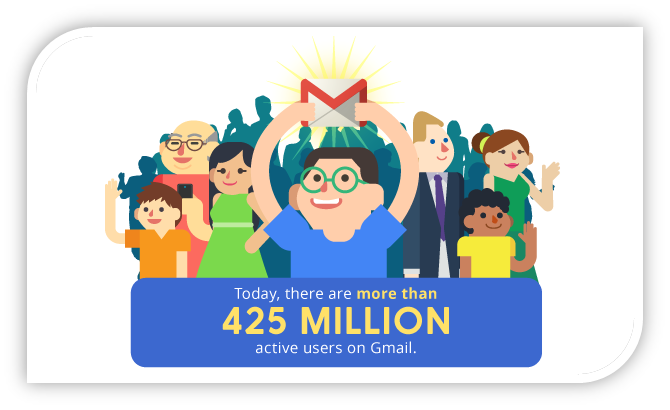 There is a high likelihood that your clients will be Gmail users, there more than 425 million of them worldwide, and so it’s best to start learning how to get your email out of the dreaded SPAM folder and into their inbox. This fantastic infographic by Google has some other fun facts you might want to check out. Let’s face it, one of the best ways of communication, connecting or engaging with your clients is via email. It is inevitable that email marketing strategies are going to play a role in your day to day life. And it doesn’t even have to be on a large scale either. Many people do not like asking what causes spam as if it was a contagious disease. It has some strange taboo in the industry and has negative association with unsolicited, impersonal bulk emails that no one likes to receive. Gmail has gotten much better at identifying and filtering out these emails, but surprisingly genuine correspondence is also lost to the filter, leaving many people wondering where they went wrong. So you’re trying to reach a journalist about your big news story or connect with a potential lead you met at an event, but you receive no answer. Even after a follow-up they don’t reply. You’ve spent a lot of money and time perfecting that monthly newsletter, every word and angle is thought-out carefully. But only 1/1000 engages with your content. Whether or not they’re interested in replying to you is another story and another post; but before you start jumping to conclusions about your approach tactics, there is a high chance that your legitimate email may have ended up in their spam folder. There are a number of ways that spam filters work, the main method is to give you spam score which will decide if your campaign or email will be let through the net. There are specific phrases that we can all recognize as spam such as ‘click here’ and there are less obvious measures that are taken into account, such as the mails people mark as spam. There is no way of knowing exactly what spam filters look for, as that would defeat the object (duh. ), but there are methods of improving your chances of getting your emails to your target audience. Check Your Content – This is probably the last reason why your email has ended up in the spam folder, but its best to check your content for specific words or phrases that could be alerting the Google filter. Be aware that words such as ‘Free’ and ‘Bonus’ will send sirens to the Gmail filter bot warning of a potential product spammer, even if it wasn’t your intention. Another couple of things to check before you hit the send button is to remove any exclamation marks from the subject line and do not over do them in the main text. Also avoid using CAPS, especially in a whole sentence. A one off extenuation of a word won’t get you penalized. *Quick tip – Never (EVER) use an exclamation mark in an email to someone you don’t know personally. Even if you have had a long term working relationship and they have never used an exclamation mark in their emails, avoid making the first move. This tip has nothing to do with spam, it’s just more professional. Thankfully, Google has brought out a great new upgrade – undo an email send if you spot a mistake. Don’t Be Dirty – Try and avoid those cheesy tactics that worked in the 1990’s because it can actually effect your Gmail account. For example don’t use “RE:” of “Fwd:” in your subject line to suggest previous communication with your target when it obviously is the first email you sent. Another reason people might think you’re a ‘dirty spammer’ is your outgoing address. You might not think it, but making having a legit ‘from’ address will also help you avoid the spam filters or automatic response of people receiving your messages. It’s best to avoid a number only address (02342@yourdomain.com) or the cursed noreply@yourdomain.com. Using support@ or contact@ is OK and actually increase the trust between you and your clients. There is a ‘black market’ method that is routinely done by many business where they buy lists of thousands of potential customers. Do not be tempted to fall into the trap as there is never a good reason to buy a mailing list. It might sound appealing, but these lists are filled with dead emails that will immediately tell your email provider that you’re sending bulk spam. If you’re unlucky you will be highlighted as a spammer and can be blocked from your email. Yes to Whitelists – When you are sending out email campaigns you might want to consider using an Email Marketing Service. Reputable service providers will ask mailboxes such as Gmail and Yahoo to whitelist their domain. In addition, you will be rewarded you for adding clear opt-in and opt-out subscribing processes. This is an excellent tool for large campaigns where you are investing time and money and don’t want to lose it to the spam filters. Here is some good advice from Google about approved senders and how to manage filter settings. As a blog manager, I ask our subscribers to add us to their address books. The more people that do that the more reputable your email address will be and prevents any future contact you have with them from being filtered into spam. If your emails are not being opened by the majority of the people you are sending to, Gmail will assess your engagement level as low and assume your content is spam. Engagement metrics are used by many of the big providers and you should make sure that people are highlighting you as ‘not spam’. Office or Home Network? – When you are working in an office environment, your colleague’s emails may be affecting your performance. Your emails can be associated with other spam that’s being sent on the network, so even if yours is legit the whole network could be filtered into spam. Images – Being balanced with your image to text ration is important. If you think about it, most spam emails have a main image and very little text – Google can detect this from a mile off and will throw you straight into spam. So next time you think about sending one picture to your colleague, think twice. Block Your Own Spam – If you are active at blocking spam mail that you receive, Gmail will look favorably on your account. So don’t just delete your junk mail, alert Gmail to them and they will reward you. Signature – Do you have a signature that links back to other sites? This might be a reason that your email going into spam. Try to keep your signature as clean as possible; debate whether it is completely necessary to link back to your Facebook profile, in my opinion LinkedIn is the only one you need. Links- Carefully think about the type of links you are sharing in your email. If you are linking to sites that Google had blacklisted, it is possible that they will also be pushing your email into the spam folder. Headers — If there are inconsistencies in the “from” and “reply to” addresses and domains, emails will be filtered as spam. Hopefully these pointers will get you thinking about your emailing strategies and help you avoid the spam filter. Overall it’s important to be a real person when sending emails, not an automated machine that is trying to reach thousands but ending up reaching 0. Even when you are sending an email to the 100th reporter, make it personal to them, to avoid the spam folder and to increase your chances of getting a reply (I started out in marketing by reading this post about ‘cold emails’ by Iris Shoor – I highly recommend you read it too! ).